One of the most pressing questions about Facebook’s future revolves around teen usage. 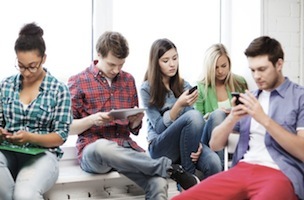 However, a new study by Forrester shows that maybe teens don’t hate Facebook after all. Forrester surveyed more than 4,500 U.S. online users between 12 and 17 about their habits on social networks and apps. Among apps they use “all the time,” both Facebook and Instagram finished ahead of Snapchat. The results were clear: Facebook remains young users’ favorite social network. More than three-quarters of online youth use Facebook — twice as many as use Pinterest or Tumblr or Snapchat, and more than use Instagram and WhatApp combined. And 28% of young users who are on Facebook say they use it “all the time,” a higher percentage than said this about any other social network. The bottom line: The sky is not falling. Facebook does not have a problem attracting or retaining teen users.